It’s morning time. The sun is shining through your curtains, you’re refreshed from a peaceful night’s sleep and the adventure of the day awaits. Excited to get out of bed, nothing is better than the soft, cushy feeling of a beautiful carpet between your toes. Carpets can bring amazing benefits to your household. With flooring being one of the biggest decisions homeowners have to make, here are a few reasons why carpet should be the flooring choice for your bedrooms. 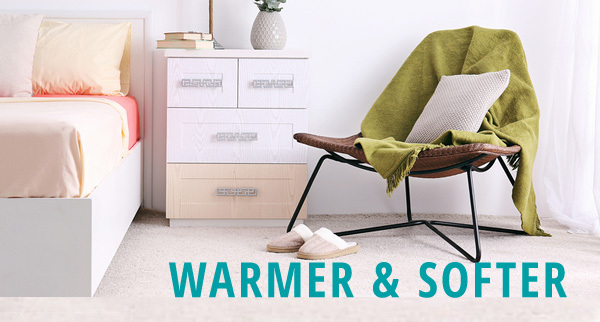 The softness of carpet provides comfort underfoot and keeps the bedroom warm, especially during winters. The shock of a cold, hard floor in the morning isn’t an issue with carpeting. This is why many homeowners choose carpet because they love the transition the carpet brings from the comfort of their beds to the cushioned feel underfoot. Many nylon carpet fibers like Nylon 6 and Nylon 6.6 are the softest kind of fibers along with being the most durable. The warmness and softness of a carpet can make a world of difference for homeowner’s comfort level. Though hardwood flooring adds a beautiful touch to the home, it can be expensive to install. Carpeting can be just as beautiful and a lot more cost effective at the initial installation. Even the highest quality of carpet tends to be about half the cost of hardwood flooring. Nowadays, carpets have become innovative in function and design due to stain-resistant technology that lasts for 10-15 years. With such technology, now more than ever is a great time to invest in a high-quality carpet. Carpets are great for hiding household messes. They’re made to trap dirt and other dust particles that a vacuum can easily dispose. In fact, the average household with carpet usually only has to vacuum once a week, sometimes even once every two weeks. Less cleaning means more recreation and time to enjoy your home. Carpets come in many shades, designs, textures, etc. With so many options, homeowners can customize their bedrooms to their specific tastes. Carpet is the perfect solution for those who want their homes to reflect their personalities. Carpet provides a cozy style. Style can be very subjective and really depends on the homeowner. For homeowners who want a warm and inviting style, carpet is the perfect choice. The bedroom is meant to be a place for people to relax and unwind. Carpet plays a major role in doing this. Not only is carpet warm and soft, but it can tie the room together and bring a secure, intimate atmosphere to the room. Carpet makes the room’s air easier to breath. Many homeowners may not think that they spend a lot of time in their bedroom, but research proves that people usually spend about a third of their lives asleep. For most people, this means they spend about of their lives in the bedroom. Besides sleep, most people who spend their days outside the house tend to spend the majority of their time in their bedroom when they are home. With all the time spent in the bedroom, it’s important to take the room’s air quality into consideration. In particular, people with breathing issues such as asthma and allergies can benefit greatly from having carpet in their bedrooms. Numerous studies have proven that carpet reduces allergens in the air by trapping them in its fibers. Vacuuming the carpet removes the allergens completely. It’s considered to be a safer option. Carpet is great for households with children and elderly people. It also provides security for those who may be a little clumsier than the average person. Carpet is much softer on the joints than hardwood floors and allows for a safer landing place for falls. Carpets, especially wool and sisal carpets, are the earth-friendly option when it comes to flooring. Due to their all-natural fibers and non-toxic dyes, carpets emit low volatile organic compounds (VOCs). Carpets can also be made with recycled content and be recycled when they are worn out. Most homeowners prefer to not hear the sounds of thumping feet in the bedroom. Carpet masks noises that hardwood floors can’t. They also absorb noise, while hardwood floors amplifies it and causes an echo. 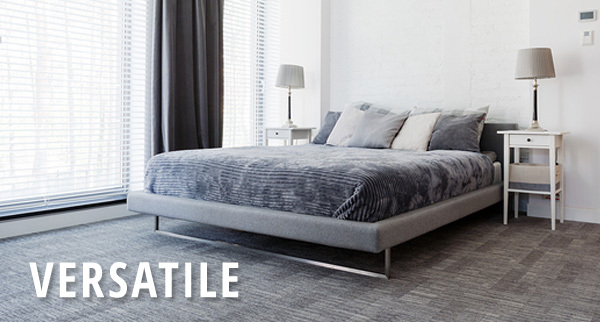 For those who want a quieter, more peaceful bedroom, carpet is the flooring option of choice. All in all, carpet makes for a great flooring option for homeowners. It’s cost effective, air-friendly and quieter than hard flooring. Carpets can come in various designs to fit your vision for your bedroom while also needing less maintenance. 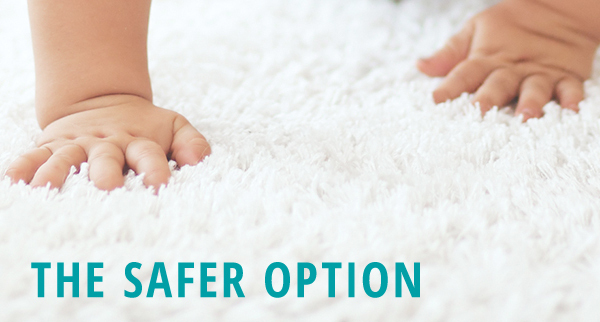 For households with children, the qualities that carpet has such a noise-absorption and softness can make for a more peaceful, safer home. 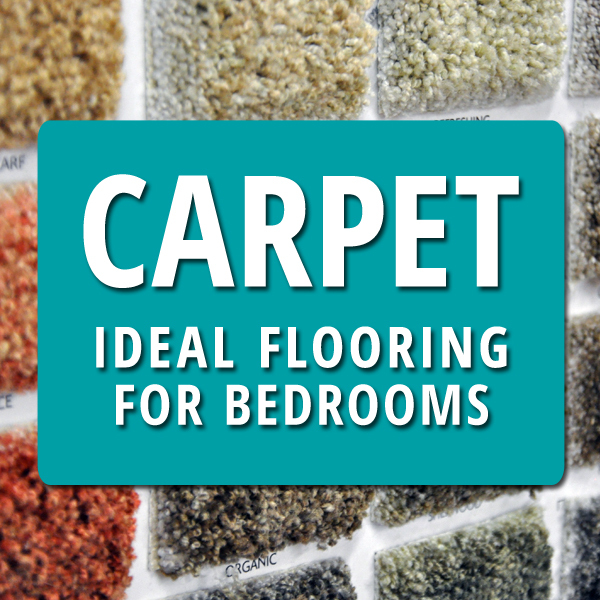 Hard flooring may be great for other rooms, but as for the bedroom, carpet is the best choice.